The accompanying CD-ROM offers instant access to the lyrics and music of contemporary worship songs and visual presentations for use with video projectors. It also contains interactive materials to engage pastors, worship leaders, and musicians in "faithful improvisation." 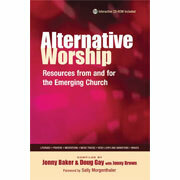 Alternative Worship is sure to spark the creativity to develop new voices in postmodern worship.  Buy Alternative Worship Now! Order the worship study today!